This month's image was taken on the 8th of October 1977. LNER A4 Pacific 4498 Sir Nigel Gresley is seen tackling Gresford Bank between Chester and Wrexham for the second Saturday in succession, working its leg of the Midland Jubilee special between Chester and Shrewsbury. All is not well however, and the train is only moving at walking pace. Within the next hundred yards or so, the train came to a halt and 4498 was unable to restart it. With the train lost in the section between Rossett and Wrexham North, Croes Newydd yard despatched a Class 25 to see what had happened, and this loco then ran down the bank to Rossett, crossed over, and came up behind the train to bank it up to Wrexham. 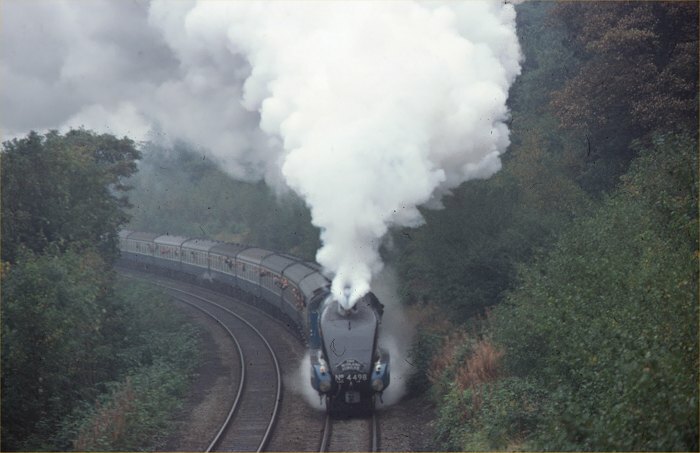 Two Jubilee special trains ran on both the 1st and 8th of October, one from London Euston to London Paddington, (The Midland Jubilee) and one from Paddington to Euston (The Western Jubilee). They were steam hauled by locos from all 4 pre-nationalisation companies over 4 legs between Chester and Newport. Of the many photographs on this site, this is one that could still be repeated, although the peaceful surroundings of Gresford bank have been disturbed by the inevitable by-pass, and the track itself has been singled. Quite where an assisting locomotive would come from today, and how long it would take to arrive is quite another matter.